Why those two snarky words at the end of the post title? Read on…. I have gazed on the walls of impregnable Babylon, race course for chariots, and on Zeus’ statue by the banks of the Alpheus, I have seen the hanging gardens, and the Colossus of Helios, the great toilsomely made by men mountains of the lofty pyramids, and the humungous tomb of Mausolus; but when I gazed on the sacred house of Artemis that towers to the clouds, the others were placed in the shade, for Helios himself has never gazed upon its equal outside Olympus. ἅλιος οὐδέν πω τοῖον ἐπηυγάσατο. Antipater lived in the second half of the second century BC; his is the earliest full list (Herodotus did one, now lost). The Walls Of Babylon substutes for the more common Hanging Gardens, but let’s not quibble yet. Various later authors could have The Big O about some of the wonders…. 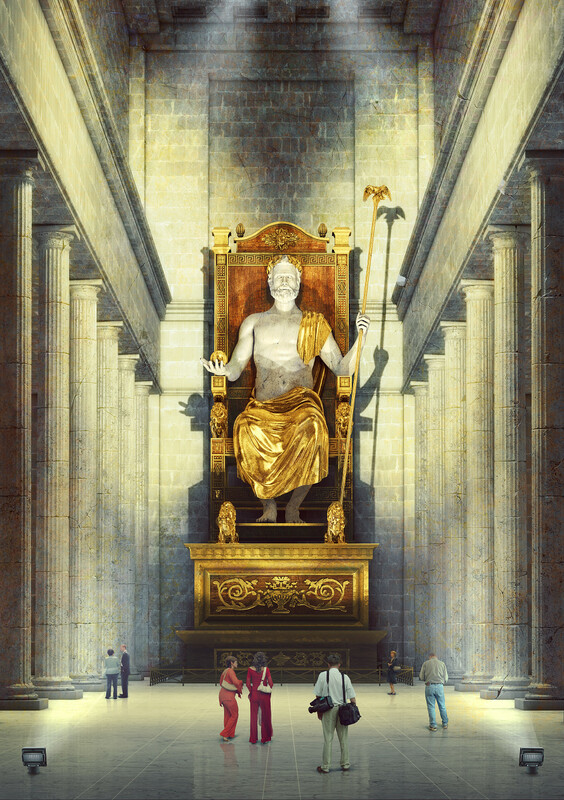 But the greatest of these was the image of Zeus made by Pheidias of Athens, son of Charmides; it was made of ivory, so big that, although the temple was very large, the artist is thought to have missed the proper symmetry, for he showed Zeus seated but almost touching the roof with his head, thus you would think that if Zeus arose and stood erect he would bust up the temple’s roof. μέγιστον δὲ τούτων ὑπῆρξε τὸ τοῦ Διὸς ξόανον, ὃ ἐποίει Φειδίας Χαρμίδου Ἀθηναῖος ἐλεφάντινον, τηλικοῦτον τὸ μέγεθος ὡς καίπερ μεγίστου ὄντος τοῦ νεὼ δοκεῖν ἀστοχῆσαι τῆς συμμετρίας τὸν τεχνίτην, καθήμενον ποιήσαντα, ἁπτόμενον δὲ σχεδόν τι τῇ κορυφῇ τῆς ὀροφῆς ὥστ᾽ ἔμφασιν ποιεῖν, ἐὰν ὀρθὸς γένηται διαναστάς, ἀποστεγάσειν τὸν νεών. I know that the height and breadth of the Olympic Zeus have been measured and recorded; but I won’t praise those who made the measurements, for even their records fall far short of the impression made by a look at the image. In fact, the god himself according to legend bore witness to the artistic skill of Pheidias. For when the image was quite finished Pheidias prayed Zeus to show by a sign whether the work suited. Immediately, thus the legend, a thunderbolt fell on that part of the floor where down to the present day a bronze jar stood to cover the place. έτρα δὲ τοῦ ἐν Ὀλυμπίᾳ Διὸς ἐς ὕψος τε καὶ εὖρος ἐπιστάμενος γεγραμμένα οὐκ ἐν ἐπαίνῳ θήσομαι τοὺς μετρήσαντας, ἐπεὶ καὶ τὰ εἰρημένα αὐτοῖς μέτρα πολύ τι ἀποδέοντά ἐστιν ἢ τοῖς ἰδοῦσι παρέστηκεν ἐς τὸ ἄγαλμα δόξα, ὅπου γε καὶ αὐτὸν τὸν θεὸν μάρτυρα ἐς τοῦ Φειδίου τὴν τέχνην γενέσθαι λέγουσιν. ὡς γὰρ δὴ ἐκτετελεσμένον ἤδη τὸ ἄγαλμα ἦν, ηὔξατο ὁ Φειδίας ἐπισημῆναι τὸν θεὸν εἰ τὸ ἔργον ἐστὶν αὐτῷ κατὰ γνώμην: αὐτίκα δ᾽ ἐς τοῦτο τοῦ ἐδάφους κατασκῆψαι κεραυνόν φασιν, ἔνθα ὑδρία καὶ ἐς ἐμὲ ἐπίθημα ἦν ἡ χαλκῆ. Strabo was a first century BC/AD geographer; Pausanias was second century AD. 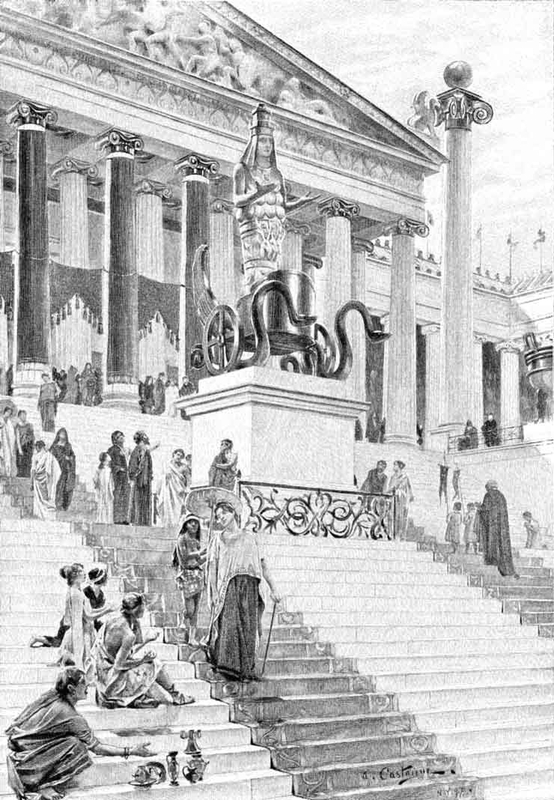 Both wrote extant geographies; Strabo’s covers a lot of ground, literally with individual entries rather short while Pausanias goes into great detail on occasion, thus our excerpt is preceded by eight chapters giving details of the statue’s decoration. 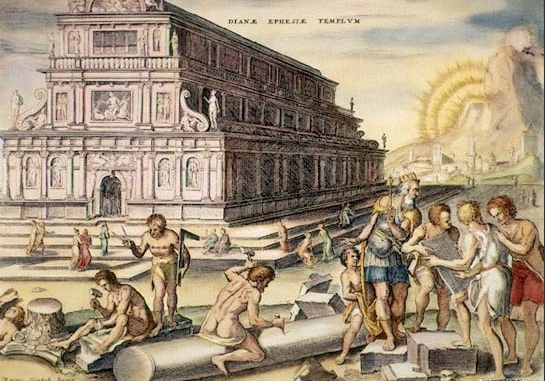 And back to the introductory poem by Antipater we have the Temple of Artemis at Ephesus. 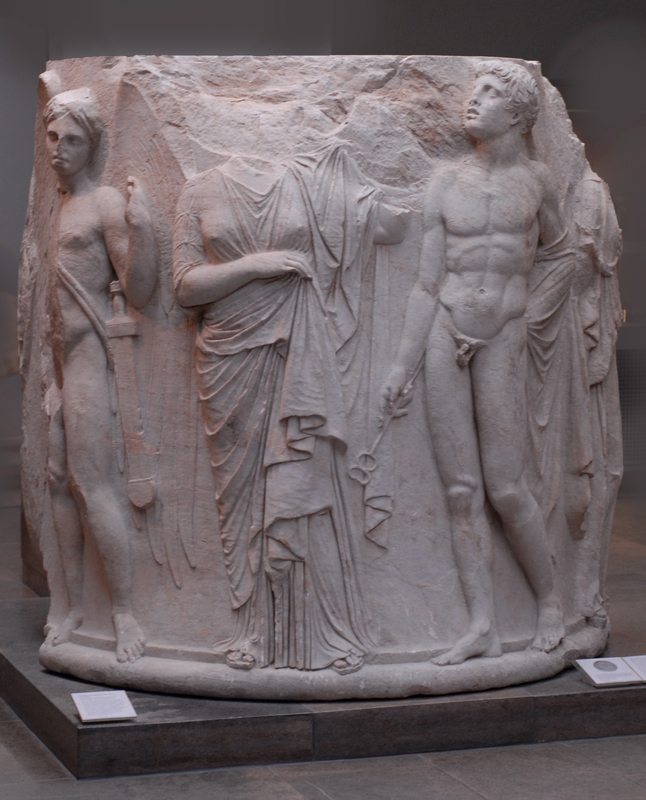 None of the Zeus statue survives; the Artemis temple survives as, e.g., part of a column in the British Museum. A picture is worth at least a thousand words, even mine. Thus…. Pretty impressive, but note it’s a little short, or the roof a little high, in light of the ancient descriptions supra. Now, I hope, you see why “sort of” is in the post’s title. Peter Clayton & Martin Price, The Seven Wonders of the Ancient World (1990). Not a scholarly study (there are too many of those), but a sane reliable discussion with good suggestions for further reading. What Did the Greeks Eat and Screw for 10 Years at Troy? Why only seven? Why not ten or twelve? Seems like a random number, used repeatedly, to enumerate wonders. This is such a great collection of passages and material! Hello, can you give me a little help with the translation? In my dictionary, I couldn’t find the word ‘κάπων’ but it seems to have something to do with ‘breath’, does this word refer to the gardens being a place where you can have a rest? Also, my dictionary says that κραναος just means strong or stony, did you take a little poetical liberty translating this with impregnable? PS My last Greek lesson was years ago, so it was a nice revisit. Cheers.